In 1823, the publication of "A Visit from St. Nicholas" (aka "The Night Before Christmas") put into circulation holiday lore that retailers, advertisers, and other true believers have been rejiggering ever since. So it's a tad presumptuous to call Charles Dickens, whose A Christmas Carol was published 20 years later, The Man Who Invented Christmas. The title comes from Les Standiford's 2008 book, now adapted into a biopic decorated with supernatural ornaments. The movie portrays the author (Dan Stevens) in financial and creative crisis after the commercial failure of Martin Chuzzlewit. He's inspired to pen a ghost story when he hears the tales spun by Tara (Anna Murphy), a teenage housemaid fresh from Ireland. So perhaps the film would better be called How the Celts Saved Charles Dickens. That, admittedly, would be something of an inside joke. The Man Who Invented Christmas was filmed in Ireland with Welsh actors in the crucial roles of the writer's difficult father (Jonathan Pryce) and dutiful wife (Morfydd Clark). But not all the enchantment comes from the Celtic realms. Director Bharat Nalluri, born in India and raised in Britain, shares a taste for extravaganza with both Bollywood and Hollywood. The movie opens with Dickens on a boffo U.S. lecture tour, a sequence designed to show that he was very nearly a 21st-century-style celebrity. Back in London, though, the writer finds himself financially overextended and subject to mockery by Thackeray (Miles Jupp). He decides quite late in the year to write a Christmas novella, and then must issue it himself. His usual publishers reject the idea, informing him that the holiday is passe. Scripter Susan Coyne's conceit is that Dickens discovers the book's central characters all around him, much like Dorothy in the Kansas she dreamed into Oz. Tiny Tim is the writer's nephew; Ebeneezer Scrooge (Christopher Plummer) is a miser first encountered at a funeral with no other mourners. And Tara gets a heck of a second job: Ghost of Christmas Past. There's also a Ghost of Dickens Past: Grim flashbacks recall the indignities of the factory where the 12-year-old Charles (Eloy Solon) worked after his father was sentenced to debtor's prison. When the grown-up Dickens finally finds the nerve to visit the now-abandoned building, the place serves as his personal haunted house. 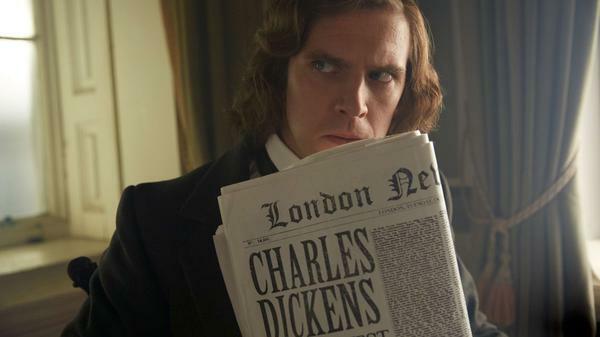 Having escaped his childhood, the movie's Dickens has become something of a Scrooge himself. With a house he can't afford full of children who are a costly burden, the writer is angered by his father's heedless spending. He also can be quite crabby when scribbling, and even unleashes his irritation on Tara. But perhaps Dickens is just overwhelmed by the ceaseless traffic through his home office. His wife and staff mostly know better than to disturb him, but his characters are forever interrupting. The bedlam borders on farce, while Mychael Danna's high-pitched score pushes the tone toward comic operetta. Like Professor Marston and the Wonder Women and Goodbye Christopher Robin, The Man Who Invented Christmas is not meant for historical purists. Many of the details are clearly fictionalized, and the dialogue flows less from Dickens novels than contemporary self-help books. When one character tells another, "You are not the victim here," it's clear we're not in Victorian London anymore. Still, better this than the umpteenth cinematic rendition of A Christmas Carol. The Man Who Invented Christmas doesn't reinvent much of anything, but its jumble of biography, fantasy, and backstage melodrama is a lot livelier than Martin Chuzzlewit.